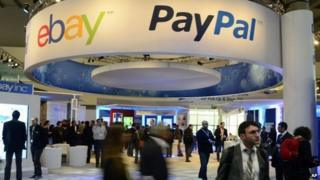 E-commerce site eBay is planning to split off its payments system PayPal into a separate company. News of the move, which is expected to be completed in the second half of 2015, sent eBay's shares 7.5% higher. It is a reversal of strategy for the company, which has previously resisted pressure to split. However, the boss John Donahoe said the logic for running the companies jointly had changed. PayPal's revenues are growing at 19% a year, twice as quickly as eBay's. Its payment system is available in 203 markets worldwide and is expected to process one billion mobile payments this year. PayPal's annual revenue is $7.2bn (£4.5bn), while eBay's is $9.9bn and is growing at 10% a year. "A thorough strategic review... shows that keeping eBay and PayPal together beyond 2015 clearly becomes less advantageous to each business strategically and competitively," EBay's chief executive John Donahoe said. Earlier this year the activist investor Carl Icahn began pressing for eBay to sell PayPal, a plan that was resisted by the eBay board. He stopped pushing after failing to gain enough support. "We are happy that eBay's board and management have acted responsibly concerning the separation - perhaps a little later than they should have, but earlier than we expected," said Mr Icahn in a statement on Tuesday. He added the separation will "meaningfully enhance value for all shareholders". Analysts cheered the move, because it is seen as strengthening PayPal's position as more e-payment systems, such as Apple Pay and Alibaba's Alipay, enter the marketplace. "Breaking off from eBay will provide PayPal with more autonomy to compete in the payments space, particularly with respect to Apple Pay and other emerging mobile wallet providers," wrote online advertising analytics firm eMarketer in a note. EMarketer estimates that in the US, mobile payments using smartphones will reach $3.5bn in 2014 and then balloon to $118bn by 2018. EBay bought PayPal in 2002 for $1.5bn, and the payments company is now eBay's fastest-growing business, with 143 million active users at the end of 2013, up 16% from a year earlier. PayPal's new president and chief executive will be the current American Express co-executive Dan Schulman. Meanwhile, Devin Wenig, currently president of eBay Marketplaces, will become the new chief executive of eBay.